We are very grateful for this beautiful house. Finally, we have a beautiful home, many thanks to the volunteer team. My family will forever be grateful. Odria Mulenga is 55 years old and has lived in Chipulukusu Township for many years. She married Whiteson Mulenga when she was 17 years old and had nine children. Sadly, two of her children passed away. She currently has five sons with physical and learning disabilities – including Abel 24, Abednego 17, and Ernest 11 – and two girls who are now married. The family used to live in a three-roomed mud structure belonging to a ‘good Samaritan’ within Chipulukusu Township. “The house had one window and a roof made of old iron sheets. It was offered to us as a temporal residence,” Odria said. 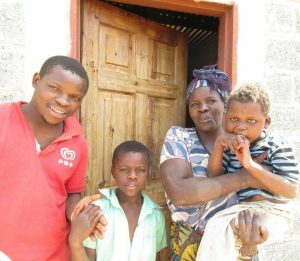 In August 2017, the Habitat team built Odria a three-roomed house and improved ventilated pit latrine and washroom under the Pamwesu Orphaned and Vulnerable Children housing project. She added that the new house has lockable doors and windows providing the family safety. Incidences of coughs, colds and flu have significantly gone down because of the cement flooring and good circulation of air. The family is now able to concentrate on sustaining themselves for their livelihood. To earn a living, Odria sells Pumpkin leaves at the local market generating an income of about K200 ($20) monthly.